Output your movie as sequentially numbered files to edit and run in third-party software. The KALEIDICA Version 2.0 (both Standard and Pro Editions) includes CD-ROM (for both Macintosh OS X and Windows XP), Installation Instructions and Hot Key List. Documentation is included on the CD-ROM as a printable Adobe Acrobat® (.pdf) file. 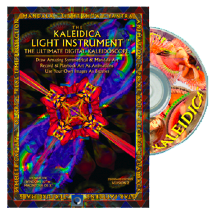 Fishrock Studios guarantees that you will be 100% satisfied with your purchase of the Kaleidica Light Instrument or we will gladly return your cost minus shipping. We ship anywhere in the world. Either version of The Kaleidica will ship within two business days of your order. All USA orders ship US Postal Service Priority Mail (usually arrives within two business days). International orders ship via international first class air. We process all Kaleidica purchases through Google Checkout Services (google.com). It's the most secure way to purchase Kaleidica because no one ever sees your credit card information. It's all handled automatically by Google. When you add Kaleidica to your shopping cart using the BUY NOW buttons, you can use your Visa, Mastercard, Discover or American Express cards. If you have an account with Google you can pay directly from your Google account.